This item is a set of 3 official Scorpion W2 OCP name tape for the Army ACu and all branches of the Military. The name tapes are embroidered with your choice of lettering (up to 15 characters). 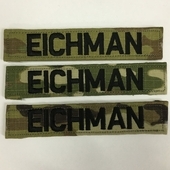 All 3 name tapes must have the same embroidered name.